One after another his posts began to appear . . . slow at first and then faster over time – each with a different amazing story about someone living in the Silicon Valley. Skip didn’t stop there though – in addition to blogging, he also added a valuable “Resource Section” full of book recommendations and information for those wanting to learn more and grow in their faith. He also has added a “FAQs about Faith” section where he addresses various questions people pose to the Christian faith and provides answers. And he allows readers to write back and share if they have additional comments which I think is a very cool feature! He also has been sending out weekly newsletters to all his subscribers alerting them to the latest post. He really has accomplished a lot in the last few months and it has been fun for me, a spectator, to watch it all come together! 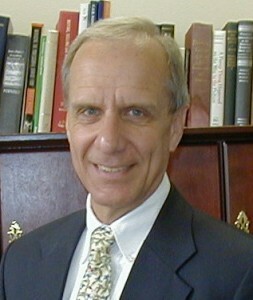 Skip’s passion for this project is evident by his persistence in writing and updating the site. He constantly is networking, interviewing, writing posts and adding more resources. I’m excited to see what may come of his blog. Not only is it an inspiration for me as a Christian in the Silicon Valley, it is also a great resource to learn more about other Christians and possibly unite them too! 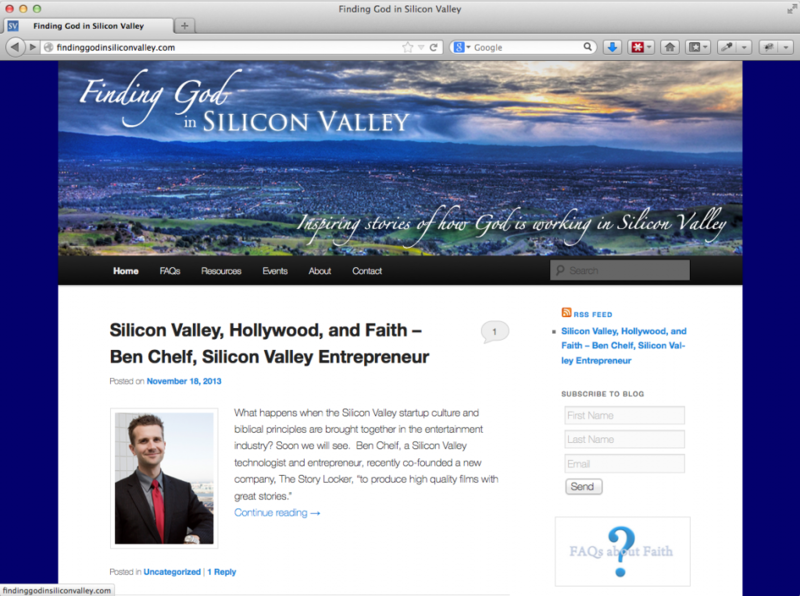 I started writing my blog Finding God in Silicon Valley around the end of December 2012. This is the first writing project of any length I have undertaken. Most people do not think of Silicon Valley as a place of God. It is known for technology, entrepreneurship, and wealth accumulation, but not for God. Silicon Valley is, in fact, one of the most unchurched areas in the country. But God is clearly at work in Silicon Valley. I have had the privilege to observe God at work in some amazing churches, Christian charitable organizations, and the lives of people.The seed of writing “Finding God in Silicon Valley” was planted in 1996 when I read Finding God at Harvard by Kelly Monroe. (now Kelly Monroe Kulberg) in conjunction with a Harvard reunion I attended. One of Monroe’s intentions with the book was to inspire people to seek out God by showing that one could be of intelligence and still be a committed follower of Christ. This gave me the idea to write “Finding God in Silicon Valley.” It was in Silicon Valley where I came to faith. 3. What is your ultimate goal in writing this blog? How do you hope that God may use it? By writing the stories about followers of Christ who are well known or who have inspiring stories, I hope God will speak to people who are not yet believers and put on their minds an interest in finding out more about what it means to have a personal relationship with Christ.I expect that many seekers will not necessarily find the “Finding God” Website on their own. I encourage believers to use the stories and Website to reach out to their friends and open conversations about faith. 4. How do you identify people to write about? And please tell me about the interviewing process? I started with people I know. For several years I have chaired the Silicon Valley Prayer Breakfast and other similar outreach ministries that feature Christian speakers. This gave me a good base of people to interview first. At the conclusion of my interviews, I always ask for recommendations for others I could interview. And I ask for introductions to those people recommended. Before I interview a person, I research the people. I try to get a bio via research on the Internet for organizations at which they have worked and articles written about them. I have a standard set of questions I ask, but do modify some of the questions based on my research. I record the interviews in audio and have the recording transcribed. This gives me a document from which to work. I have also started recording the interviews on video and expect I may intersperse videos in the profiles. 5. If someone knows of a good person to feature, what can be done so that they may possibly be interviewed? I ask that they contact the person first to see if there is interest. Once the interest is confirmed, I get an introduction and schedule a time to meet. In some cases I have done interviews over the phone. And with some people I have had the opportunity to hear them speak at an event. 6. What resources have you found helpful in writing this blog? People have been the biggest help to me with their encouragement, prayer, and suggestions. Technologies I have used include WordPress for the Website and Mail Chimp for email alerts when I have posted a new story. I use Rev.com for transcriptions and have used various other audio and video tools as well. 7. You have other resources on your website besides people. Tell me about those. Yes, I have a resource section which includes books people might find useful – both seekers and followers of Christ. I also feature books written by people profiled on the site. In addition, I have a section listing upcoming events – typically events featuring leaders giving their testimonies. I also have a section called FAQs (frequently asked questions). This includes some of the most popular questions (e.g., Are miracles possible?) asked by seekers. In addition, the Website also includes multiple ways to search for past stories and people featured on the site. What is your intention in having those? It is my hope that these additional features will provide useful resources for seekers to explore issues of faith. 8. Have you found God in the Silicon Valley – please tell me about your own experience if you feel comfortable? Yes, I did find God while living in Silicon Valley. I grew up in a loving family and attended the Catholic Church. But I was a child of 1960s and 1970s. I went to Harvard during a period of great turmoil in the country and especially on college campuses. My generation rejected many things, including organized religion. Without much fanfare, I simply stopped going to church. It did not seem relevant to my life. I can say that I never rejected God, but did not do anything to seek Him out or to have a relationship with Him. I even briefly explored religions other than Christianity. It was around 20 years before I accepted Christ as my savior. My life was more about building a family and my career. During that period, various people and circumstances caused me to consider faith again. But it was not until my 5 or 6 year old daughter was invited to attend a Vacation Bible School and my wife and I were invited to attend the same church that I started to seriously consider faith. For years I felt that there was something missing in my life, in spite of having a wonderful family, some athletic success, and a good career. It was later that I came to learn that philosopher and mathematician Blasé Pascal called that “something missing” a “God-shaped vacuum.” Success, power, money, and even family cannot adequately fill that vacuum in any satisfying way. Only God can. The sermons I heard at that biblically-based church resonated with me. I started reading the Bible and Christian apologetics. It made sense to me and explained the world around me. After accepting Christ in the late 1980s, God put on my heart two things – a desire to live out my faith day to day with family and in business and the desire to help others on their spiritual journey. I helped start a weekly meeting of a group of Christian businessmen to help each other learn how to live out faith day-to-day. That group has been meeting for nearly 20 years. I also began to have one-on-one conversations with people about faith and joined, as a co-leader, a ministry called Strategy for Living. I helped reorient Strategy for Living and subsequent ministries, including the Silicon Valley Prayer Breakfast, to focus on attracting seekers. 9. What resources/suggestions do you do you have (if any) to help new Christians get further connected with others and grow in their faith? I strongly suggest that a new Christian start reading the Bible, engage in daily prayer, find a biblically-based church to attend, and get into a small group to help him or her grow in their faith. Like anything else, to grow takes discipline. Faith is no different. The new believer might also find it useful to read books by Christian thinkers. Many good books are listed on the “Finding God in Silicon Valley” Website. 10. Your ultimate presentation of this material may not just be a blog, what other plans do you have to do with this material? And how might people keep up to date with other things you are doing? I do plan to turn what I have found in researching and writing the blog into a book. I hope to publish the book in 2014. I also am available to speak at different groups. In November I spoke about my observations gleaned so far in developing Finding God in Silicon Valley at a marketplace ministry called the Chinese Entrepreneur’s Association. In the spring I am scheduled to speak at the men’s fellowship at the Saratoga Federated Church. Thank you Skip for sharing! It has been a pleasure to be able to help you a little bit along the way and I am eager to see what awesome things God will do through your work! This is a wonderful interview! Skip is a great leader in Silicon Valley both professionally and spiritually. Having him as my Bible Study group leader for the past 5 years has been a blessing. I have also been inspired by Skip’s blogs. I can’t wait till his book comes out next year. One author to another, I would say, it will be a fabulous journey. Naphy, you did a great job with the interview. You are a talented web designer. I am very happy with what you did with my site! Thank you Sehin!! How wonderful to have been in the same Bible Study for so many years!!! How neat to be able to watch his journey unfold with this project! I’m excited to finalize your website next Sehin!